This one’s not for the squeamish! Dan shows you how to get all of the best meat a rabbit has to offer. 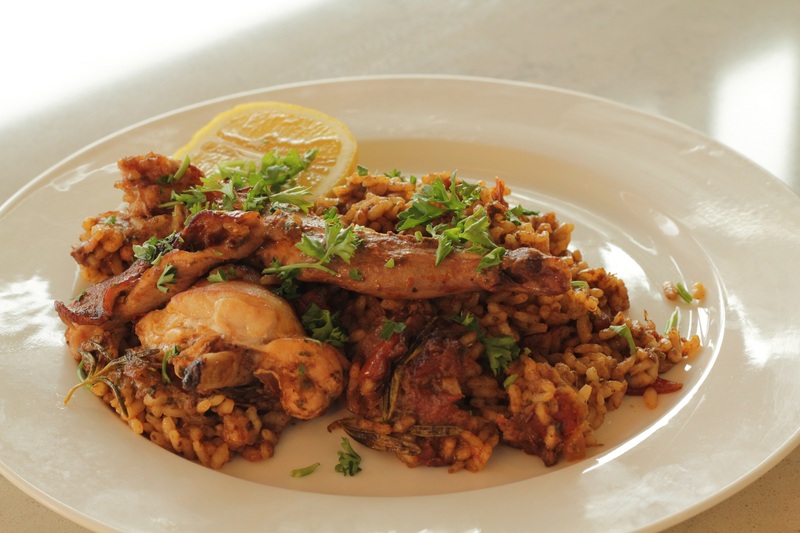 Kidney and liver piccata is combined with braised rabbit and Spanish rice to create a gorgeous paella. Some shopping tips – be sure to get your hands on bomba rice – it’s more expensive than your standard rice but it makes the best paella. Also use wild rabbit if you have the option, as it will maximize flavour. • Blend in a food processor until liquefied. Cook very slowly on a low heat in a thick bottomed pan for 1/2 hour, uncovered. • Pre-heat a frying pan to a high heat and start to joint the rabbit. Set aside the kidneys and the liver for the piccata. Cut a couple of sections of the saddle. If you like, you can take the belly for some added fat. Cut the hind legs into two sections. Pour in the olive oil into the pan then add the rabbit. Do not put the liver and kidneys in yet. Cook for about a 2 ½ – 3 minutes until the rabbit starts to become lightly browned. When this happens, flip the pieces of rabbit and add in the liver and kidneys for another 2 ½ – 3 minutes. After the rabbit has browned on both sides, remove from the pan and reserve to the side. • Combine paprika, salt, nyora pepper,garlic cloves, parsley and stock in a container. Use a hand blender to mix it all together. After the liver and kidneys have had a few minutes in the frying pan add them to the piccata and blend/grind them together. It’s ok if they are not fully cooked yet. • Pour the piccata into the still hot frying pan, which has had the rabbit removed by now. Boil off the most liquid from the piccata. Keep stirring to avoid the piccata from burning and sticking to the pan. • After only about a minute the consistency should be more oily than watery. Add in the sofrito and a pinch or two more salt. Simmer for a bit to allow the onion in the sofrito to cook. • Add in the Bomba rice and fry it along with the sofrito and piccata and fresh rosemary. • After a minute or two add in the stock. Then add the rabbit back in, including any juice that may have come out of the rabbit. Place in the oven for 15 minutes. • Remove from the oven, make a mound with the rice then add pieces of rabbit on top with a bit of chopped parley and lemon to the side.